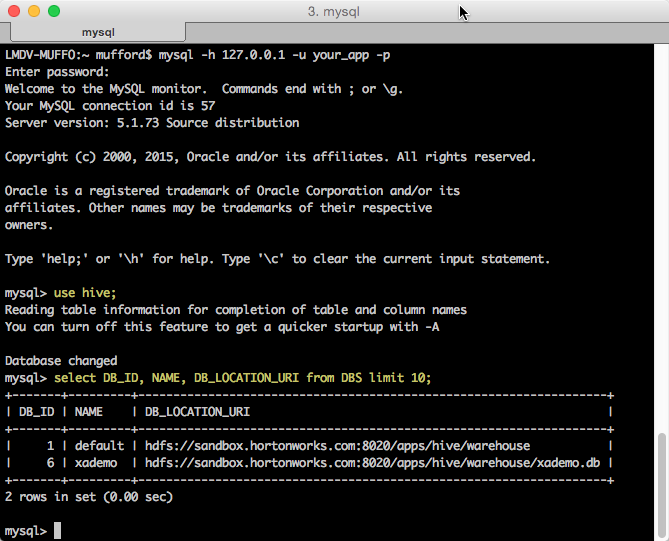 One of the Hadoop automation components I’m currently working on needs metadata from HCatalog, which is stored in MySQL (at least, that’s how it’s configured in my environment). Now, call me boring, but I prefer to do local dev instead of developing in production. 🙂 To this end, I’ve already installed Hadoop via homebrew. However, I had to spend a ridiculous amount of time configuring my local dev environment to emulate our production stack, and I didn’t want to have my team waste devote the same amount of time in order to use this new tool for local dev. The solution? 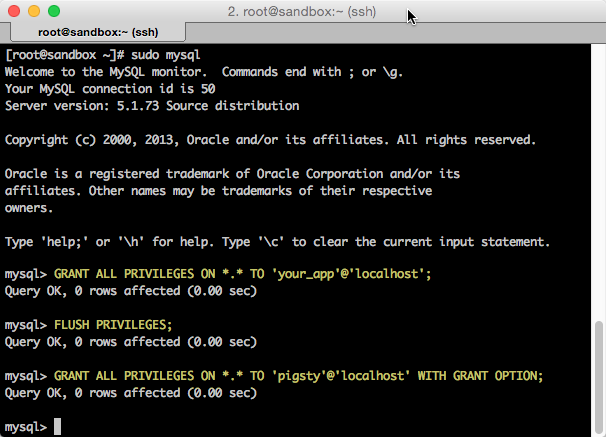 Hortonworks Sandbox VM. 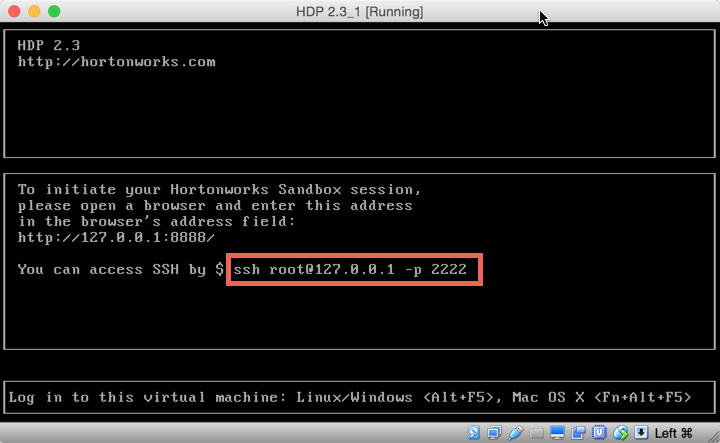 The Hortonworks Sandbox VM provides an easy way to get up and running with a local Hadoop dev environment. Granted, it may not perfectly emulate your production environment, but it dramatically narrows the gap. There are other Hadoop VM offerings out there, but I went with the Hortonworks VM because it was already installed and I’m lazy efficient like that. The first thing we’ll need to do is configure the VM to permit traffic on the MySQL port (3306) between your laptop and the VM. 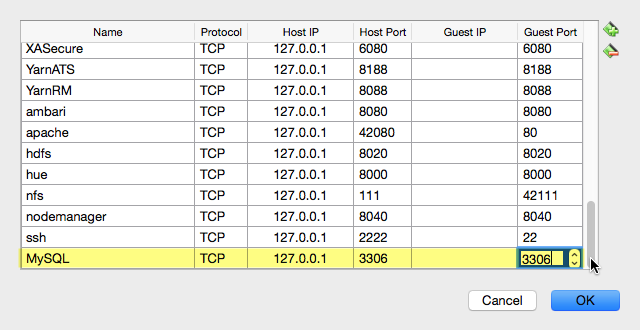 Add a new port forwarding rule. In my app, this is a small green + icon in the upper-right-hand corner of the window. 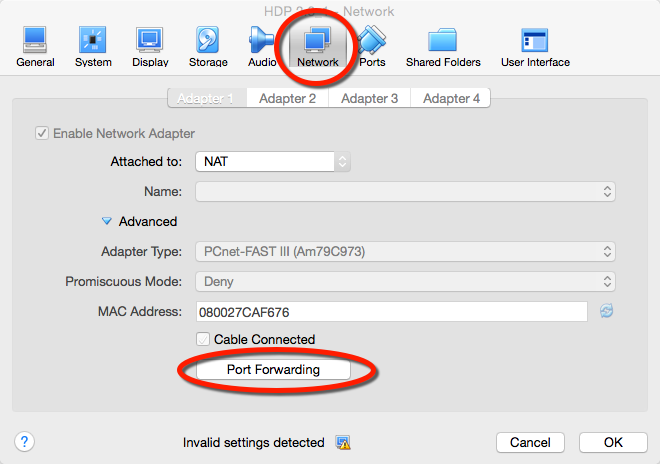 Connections on port 3306 should now forward to the VM. 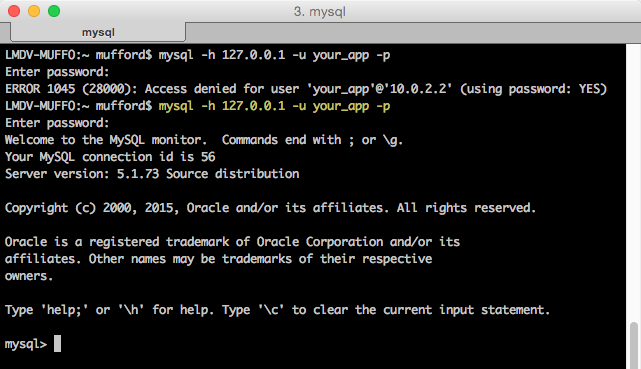 Now your app can log into MySQL locally. BUT… your app can’t connect from your laptop yet. Conceptually, think of connecting to a VM as connecting to another server. This means “localhost” won’t be sufficient; you’ll need to grant access to your IP (or %, if you live dangerously like that). Note: As of the time of this writing, the default HCatalog metastore is in the hive database. You should now be ready to connect to HCatalog from Python! As an example, here’s a Python script that outputs a list of databases and tables in HCatalog. You can also find this script on my GitHub repo if you prefer or have copy/paste issues.
" ON d.DB_ID = t.DB_ID "
Anyone who regularly works with query languages invariably develops personal preferences. For T-SQL, it may be a preference for which metadata is included with the results of a query, how quoted identifiers are handled, or what the default behavior should be for transactions. These types of settings can typically be configured at a session level, and Hive is no exception in allowing this. 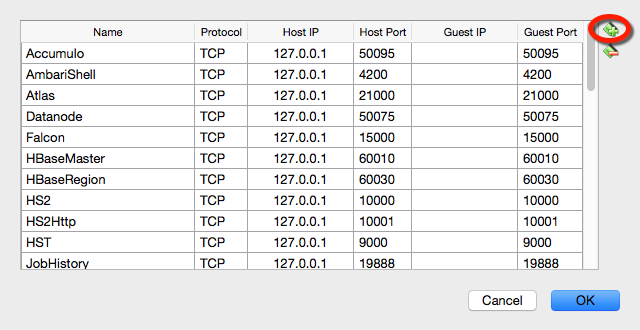 In fact, Hive provides users with an impressive number of configurable session properties. Honestly, you’ll probably never need to change the majority of these settings, and if/when you do, it’ll most likely apply to a specific Hive script (i.e. to improve performance). However, there are a handful of Hive settings that you may wish to always enable if they’re not already defaulted server-wide, such as displaying column headers. One option is to set these manually at the start of each session, using the SET command. But this can quickly get tedious if you have more than 1 or 2 settings to change. A better option in those scenarios, and the topic of this blog post, is to use a HiveRC file to configure your personal preferences for Hive’s default behavior. For those of you not familiar with the concept, Linux commonly uses RC files — which I believe stands for “runtime configuration,” but don’t quote me on that 🙂 — for defining preferences, and various applications support these, typically in the format of .<app>rc. These will usually live in a user’s home directory, and some examples include .bashrc, .pythonrc, and .hiverc. 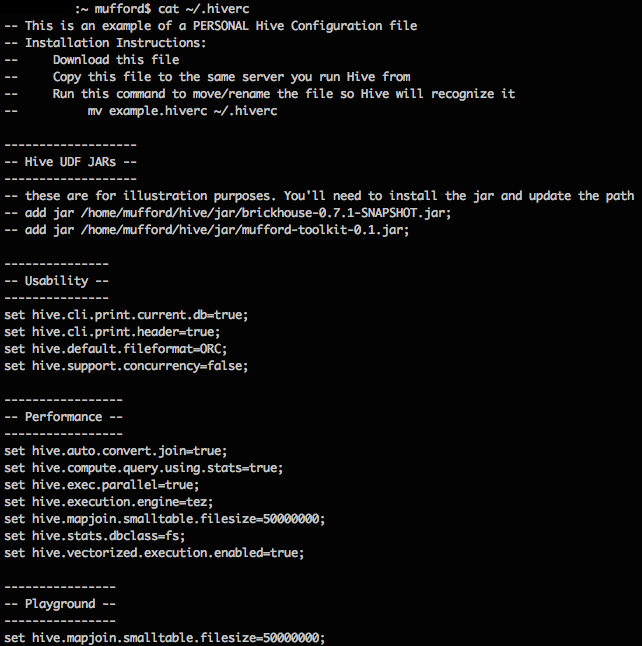 Now that we have a little context, let’s walk through how to create your personal .hiverc file. Note that all of these steps take place on the same server you use for connecting to Hive. You should be back at your bash prompt. Now run these commands to verify everything is working as expected. # bash # view your HiveRC file to ensure everything looks good cat ~/.hiverc # enter Hive hive # verify settings set hive.cli.print.current.db; # etc. etc. That’s all there is to it! Not too hard, huh? 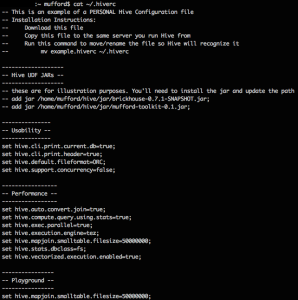 But to make things even easier, I’ve posted an example of my personal HiveRC file on my Hadoopsie GitHub repo.